Bright ruby color. Creamy, fruity aromas of milk chocolate, freshly brewed coffee, whipped cream with caramel, and berry confection with a velvety, vibrant, fruity medium body and a seamless, interesting, medium-long bread budding with blueberries, condensed milk, toasty custard-filled Danish, pickled berries, and cocoa powder finish with silky tannins and heavy oak flavor. An instantly appealing Chancellor that offers gobs of creamy oak flavor and luscious fruits. Bottom Line: An instantly appealing Chancellor that offers gobs of creamy oak flavor and luscious fruits. 82 • Johnson Estate 2013 Freelings Creek Reserve, Chardonnay, New York State 12% (USA) $12.99. 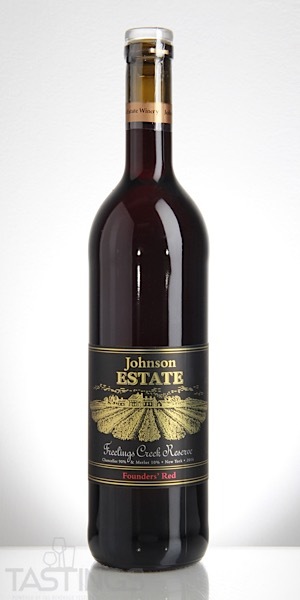 81 • Johnson Estate Estate Grown, Cream Sherry, Lake Erie 17% (USA) $18.99. 93 • Johnson Estate "Maple" Estate Grown 21% (USA) $14.99. 81 • Johnson Estate 2014 Estate Grown, Dry Riesling, Lake Erie 11% (USA) $12.99. 88 • Johnson Estate 2014 Estate Grown, Traminette, Lake Erie 12% (USA) $12.99. 89 • Johnson Estate 2014 Freelings Creek, Cabernet Sauvignon, New York State 13% (USA) $14.99. 84 • Johnson Estate NV May Wine, Vidal Blanc, Lake Erie 12% (USA) $14.99. 94 • Johnson Estate NV May Carbonated White Wine, American 12% (USA) $15.00. 86 • Johnson Estate NV Cherry Wine, American 21% (USA) $15.00. 86 • Johnson Estate 2015 Founders’ Red Freelings Creek Reserve, New York State 13% (USA) $14.99. 84 • Johnson Estate 2016 Ice Wine , Vidal Blanc, Lake Erie 12% (USA) $34.99. 89 • Johnson Estate 2016 Freelings Creek Reserve Dry, Riesling, Lake Erie 11% (USA) $13.49. 89 • Johnson Estate 2016 Freelings Creek Reserve Semi-Dry, Riesling, Lake Erie 11% (USA) $13.49. 90 • Johnson Estate 2016 Freelings Creek Reserve Sweet, Riesling, Lake Erie 11% (USA) $13.49. 89 • Johnson Estate 2016 Freelings Creek Reserve Black Locust Dry, Riesling, Lake Erie 12% (USA) $18.99. 90 • Johnson Estate 2016 Freelings Creek Reserve, Traminette, Lake Erie 11.5% (USA) $13.49. 84 • Johnson Estate 2016 Estate Grown, Seyval Blanc, Lake Erie 11% (USA) $9.99. 82 • Johnson Estate 2017 Freelings Creek Reserve, Marechal Foch, Lake Erie 12% (USA) $13.99. 90 • Johnson Estate 2016 Freelings Creek Reserve Founders’ Red Blend, New York State 13% (USA) $13.99. 90 • Johnson Estate 2017 Estate Grown Ruby Dry Rosé, Lake Erie 11% (USA) $13.99. 89 • Johnson Estate 2017 Freelings Creek Reserve, Vidal Blanc, Lake Erie 11% (USA) $12.99. 88 • Johnson Estate 2017 Estate Grown Sweet Wine, Concord, Lake Erie 11% (USA) $8.99. 89 • Johnson Estate 2017 Estate Grown Pink Sweet Wine, Catawba, Lake Erie 11% (USA) $8.99. 84 • Johnson Estate 2017 Estate Grown Sweet Wine, Niagara, Lake Erie 11% (USA) $8.99. 85 • Johnson Estate 2016 Freelings Creek Reserve, Chardonnay, Lake Erie 12% (USA) $13.99. 90 • Johnson Estate 2016 Freelings Creek Reserve, Cabernet Sauvignon, New York State 13% (USA) $15.99. 88 • Johnson Estate 2016 Freelings Creek Reserve, Pinot Noir, Lake Erie 12% (USA) $15.99. 91 • Johnson Estate 2017 Ice Wine, Chambourcin, Lake Erie 10.6% (USA) $35.99. 86 • Johnson Estate 2017 Freelings Creek Reserve Toasted Oak, Chardonnay, Lake Erie 12% (USA) $14.99. 84 • Johnson Estate 2017 Freelings Creek Reserve Bright Steel, Chardonnay, Lake Erie 12% (USA) $14.99. 85 • Johnson Estate 2017 Freelings Creek Reserve Black Locust Dry Riesling, Riesling, Lake Erie 11.5% (USA) $24.49. 85 • Johnson Estate 2017 Freelings Creek Reserve Dry Riesling, Riesling, Lake Erie 11% (USA) $14.99. 87 • Johnson Estate 2017 Freelings Creek Reserve Semi-Dry Riesling, Riesling, Lake Erie 11% (USA) $14.99. 87 • Johnson Estate 2017 Freelings Creek Reserve Sweet Riesling, Riesling, Lake Erie 11% (USA) $14.99. 88 • Johnson Estate 2017 Freelings Creek Reserve, Vidal Blanc, Lake Erie 11% (USA) $11.49. 92 • Johnson Estate 2017 Freelings Creek Reserve, Traminette, Lake Erie 13.5% (USA) $14.49. Chancellor is a French hybrid grape that is grown in various parts of the US, including New York State, Michigan, Illinois and Nebraska. 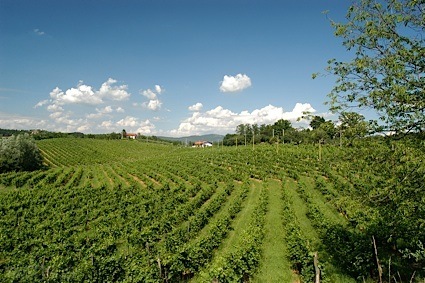 The wine is a simple, fruity red that is made as a stand-alone variety or sometimes blended with more complex red grapes. At its best, Chancellor is a spicy, lightly tangy red that is meant for early consumption with hearty dishes such as pepper steak or stews. Johnson Estate 2016 Freelings Creek Reserve Founders’ Red Blend, New York State rating was calculated by tastings.com to be 90 points out of 100 on 9/24/2018. Please note that MSRP may have changed since the date of our review.